If you’ve been to Paris, you know that there are lots of cafés but the quality of the coffee isn’t the focus. 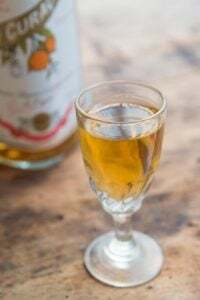 However, like all cities, Paris evolves, and in the past few years, a whole battalion of younger folks, some French, and others from elsewhere, have opened shops sprouted up far and wide, at a rate that was so fast, that I couldn’t possibly try them all. (And with all that caffeine surging through my system, I would have lost 6 1/2 years of sleep.) And other people were doing such a good job of cataloging them all, that I just sat back and focused on other things. 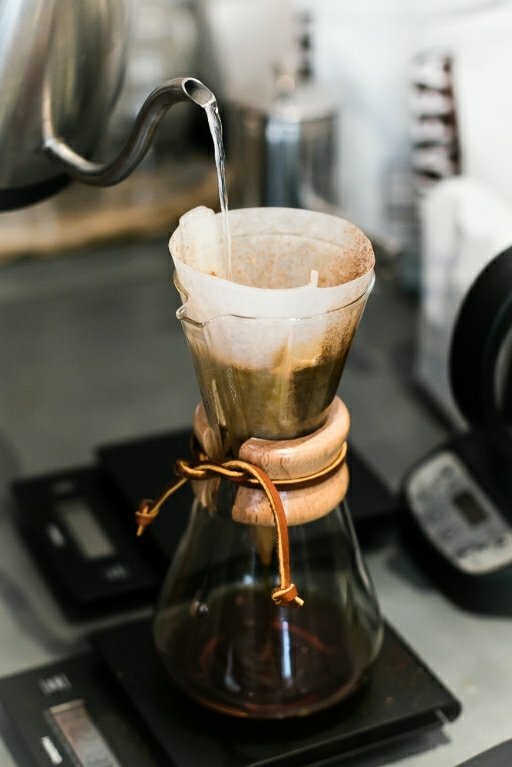 Being from San Francisco, where coffee-culture can be obsessive compulsive – if you didn’t study the micron size of each granule of coffee grinds or have your water analyzed to ensure your coffee was as clear as a sleek Chemex carafe – you, and your coffee, simply weren’t up to snuff. 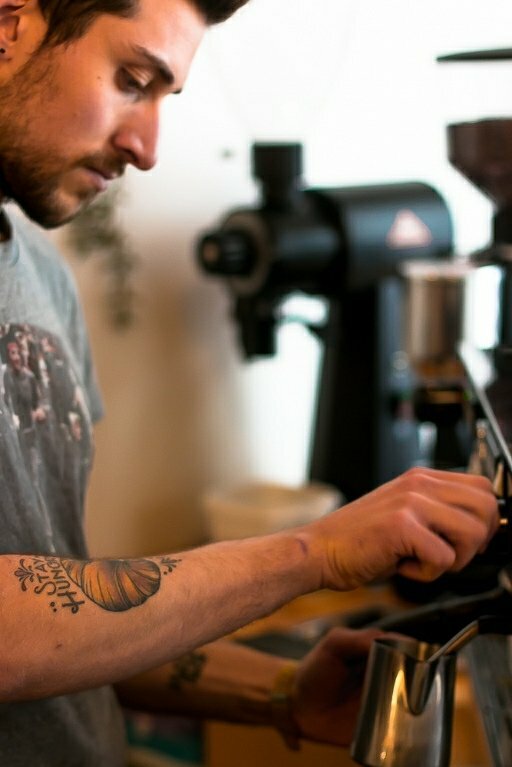 I went to espresso school in Italy, where I watched and learned from the Italian experts how the seemingly simple task of extracting a perfect espresso actually depended on having mastered a few key techniques and having the right grinder and espresso machine. When I lived in San Francisco, I religiously ground my own coffee every morning (in a burr mill, thank you very much). But I got tired of the noise, wiping the grains of coffee off the white tiled floor (which the previous residents had installed; I guess they didn’t grind their own coffee…or make toast) and the counter. Then I got tired of feeling like no matter how concerned I was about the coffee I was drinking, I wasn’t doing it right. There was always someone who was roasting his own green beans, who had a fancier grinder, or who sourced her coffee from the northeasternmost tip of a small island off the coast of Krakatoa. No matter what you were doing, someone was sure to point out to you that there was another place you should be going to, or another way you should be preparing it. In Paris, the coffee sold at most of the roasteries wasn’t really any better than what you could buy pre-packaged, so I settled for those. And when I went to Italy, I would pack any spaces in my suitcase with 500g (about a pound) packages of coffee, and savor them for a few months after my trip. My first inkling that things had changed dramatically in Paris was when I heard about Belleville Brûlerie. I started following them online, as they showed the weekly progress of building a place of torrefaction on a little street atop Belleville. While I was walking from the Pyrénees métro station on a blustery Paris morning, as I reached the intersection of Avenue Simon Bolivar and Rue Pradier, where the Brûlerie is located, I wasn’t sure if I should head up the hill, or down. But the answer was, indeed, blowing in the wind, and I followed my nose toward the roasting beans, down the small street to the glassed-in coffee roaster. 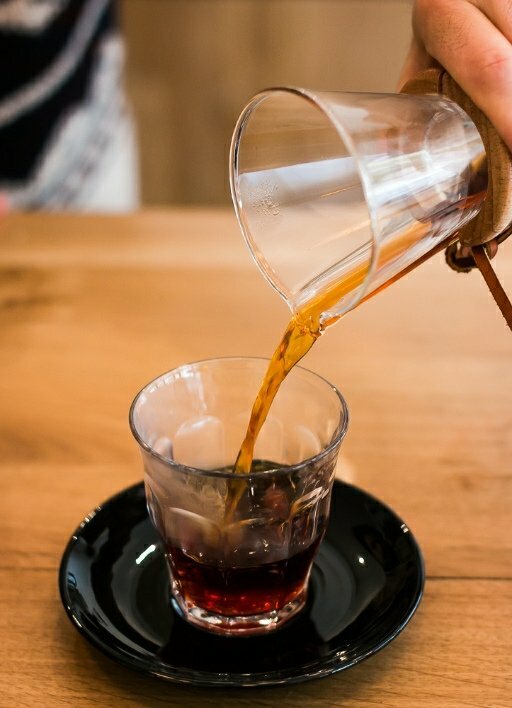 In addition to changing my tune about grinding and obsessing over each cup of coffee, as a dedicated espresso-drinker, I sneered at those who drank filtered coffee. Also those huge mugs of coffee were so caffeinated, they gave me the jitters. 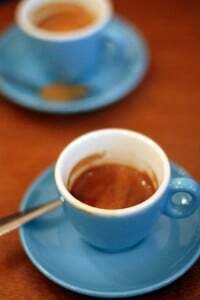 (Because of the quick extraction, and size, espresso has less caffeine than drip or filtered coffee.) But I haven’t been as excited about the espresso shots I’ve had in the coffee shops in Paris (new and old) and started to change my tune about coffee, realizing (like Adam), that maybe I need to shift my priorities, and not expect so much from espresso (unless I’m in Italy), and move to filter, the method seemingly preferred by many of the current wave of coffee shops in Paris. In addition to the stereotype about all the coffee being bad in Paris, another one is the image of the not-so-nice Frenchman. 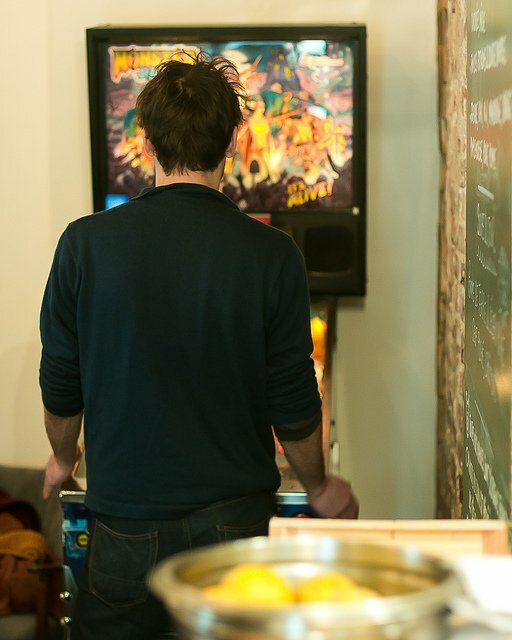 Aside from the one I have at home, Nicolas Allary, the owner is Holybelly is one of the friendliest people I’ve met in Paris. I’d been trying to go to Holybelly for a while and – as is the custom – whenever I try to go somewhere, they just happen to be closed for a fermeture exceptionnelle. The first time I tried to go to Holybelly, it was the period after Christmas when just about everything else is closed. When I posted the second time sign on my Instagram feed, someone made a comment about French working habits and instead of responding like so often people do online, Nico replied with a good-natured apology. And let me tell you, unlike good coffee and nice Frenchmen, apologies are still the exception (like pinball machines), rather than the rule around here. Someone at the party took me to task for mentioning that a lot of the new, celebrated restaurants in Paris were either opened by cooks who weren’t French, or who were French but had worked abroad, but I don’t really care who makes what I’m eating, or where they are from. I just care if the food is good and fresh. The cooks in the kitchen at Holybelly, two charming women whose passports I didn’t scan, cook up food using local ingredients as much as possible. In a trend that restaurants in Paris are starting to embrace, Holybelly notes on its menu that nothing is frozen or microwaved, nor are they serving cuisine Metro, named for a chain wholesaler of pre-packaged foods. And he’s right; the place is packed. I went back for lunch during the week, getting there well before noon. And by the time I left, there was a small crowd outside the door, waiting for a table. The menu changes often, and when I went for lunch, I was tempted by the open-faced smoked mackerel sandwiches served on grainy Nordic bread from Liberté bakery on the corner (39, rue des Vinaigriers), and Saag paneer with pan-roasted butternut squash on a bed of spinach with house-made flat bread, griddled to order. I hadn’t had a good ol’ American-style breakfast in a long, long time. And with a generous cup of filtered coffee (made with water they purify beneath the shop), my eggs came out perfectly cooked along with toast, made from bread baked just up the street. 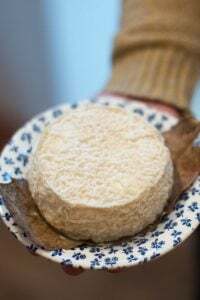 The Échiré, French-made butter for the toast was hard not to smear directly on my tongue, and the little cubes of marinated sheeps’ milk cheese gave me the little bit of salt that I remembered from my breakfasts in Israel and Lebanon. 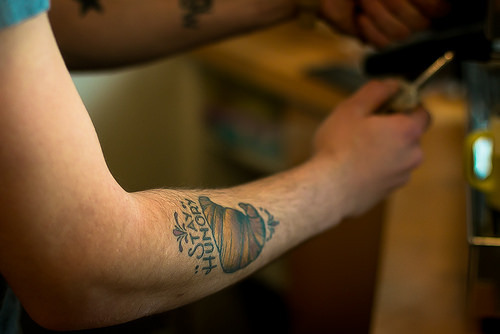 I sat in the small wooden booth sipping my Himalayan (not Krakatoan) coffee, watching servers delivering food to the tables, and Nico tending the bar, pulling shots of espresso and filling cups with steaming dark brew. (All the water in the shop is specially filtered, and raw milk is used for the coffee drinks.) 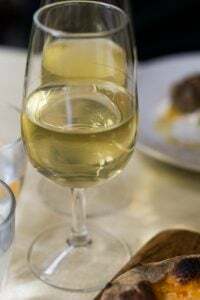 As I sat there and polished off the last of my coffee, with the cooks happily buzzing away in the kitchen, efficiently preparing beautiful plates of food- -no doubt fueled by Belleville Brûlerie coffee – I was delighted to see how the next wave of young talent was succeeding in Paris. And crafting their own set of standards for the future. UPDATE: The team at Belleville Brûlerie have opened La Fontaine de Belleville, a café serving their coffee and food. 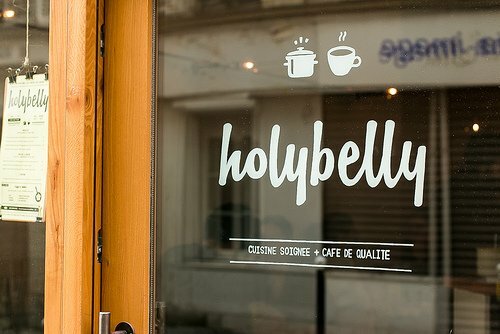 UPDATE: Holybelly has opened a second restaurant at 5, rue Lucien Sampaix, which is open daily from 9 am to 5pm. 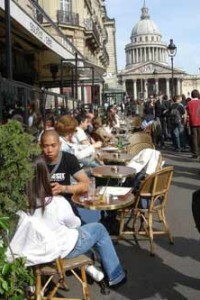 Where Are All The Cafés In Paris? This new French coffee roastery is exciting, and it will surely improve the quality though most restaurants are still serving bad coffee. 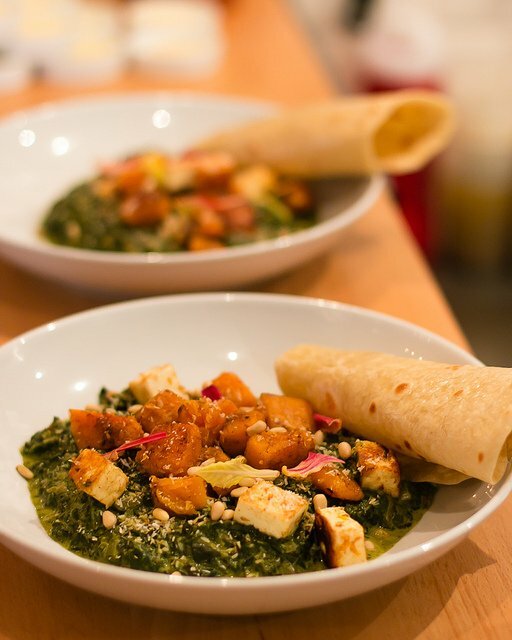 You must have heard about Coutume Café too which also has some pretty good selections. Really love to hear the improvement. Last friday I had the chance to drink fresh brewed coffee roasted some houses away with homemade cake – oh, my – nothing better in the world at that moment. Seems I have to come to Paris soon again, too. Well, today I leave allready for Berlin – so it has to wait – well, I can not wait to go in Berlin to my faboured tapas – bar just around the corner where I will stay. Not a coffee drinker myself, a personal fault I know, but my traveling companion most certainly is so I will be noting Belleville Brulerie for our Paris trip in early May. My breakfast usually consists of good bread, good butter, and jam, but I’m strangely drawn to the “American breakfast” in your photo. What is the round disk next to the toast? The plate looks divine and the addition of the marinated sheep’s milk cheese truly whets the appetite! Merci, David. That is a hashbrown potato cake, that was incredibly delicious. I wanted another one! The coffee scene has definitely changed since I lived there in the mid 1990s. I’m excited to do a “coffee tour” based on excellent info like this blog post when I am there this summer! Also a non-coffee drinker (must be a defective gene) I too was taken by the photo of the American style breakfast. Those eggs look about as perfectly cooked as I’ve ever had. It’s 7 am ish now where I am in California. Think I’ll go out to a breakfast joint and see if someone can’t come close to that photo. The Moka pot makes good coffee but you can’t get the same pressure that an espresso-machine will make, so it’s not a true espresso. 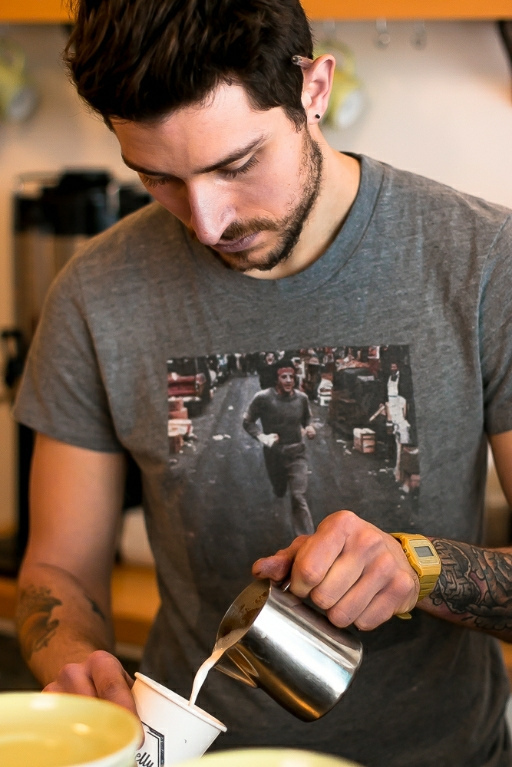 There is an excellent article in the Atlantic by Giorgio Milos, Will Moka Be America’s Next Coffee Tradition? which offers tips from an expert on how to use one to its best advantage. The folks at Belleville Brûlerie told me a good way to use one, to avoid overcooking the coffee, is to pour boiling water into the bottom of the pot (I always use cold) so that it brews faster. Hot water from the tap is usually not the best water to use, so they recommended boiling water in a separate device, such as a bouilloire électrique, or an electric kettle that boils water very quickly, that many French homes have. “bucket list” and hope to get there soon. Till we meet again (thru postings). The L.A. Times had an editorial this morning that expressed the idea that France had lost it’s mojo. Reading your lovely blog I realize that is not true. Well, the French philosopher who wrote the article was probably just depressed from not having a proper cuppa. There are bruleries all over Paris but the one on little rue Pradier seems particularly attractive. However it is a bit of a walk to get there from the Pyrenees metro station – I suggest taking bus 26 direction gare Saint Lazaire from the stop just by the metro. Get off at next stop – Buttes Chaumont/Botzaris. 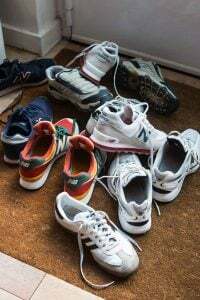 Rue Pradier is then just a few steps away. Get a free bus map from the ticket seller at the metro. . I want to make perfect little round eggs like that. How?? 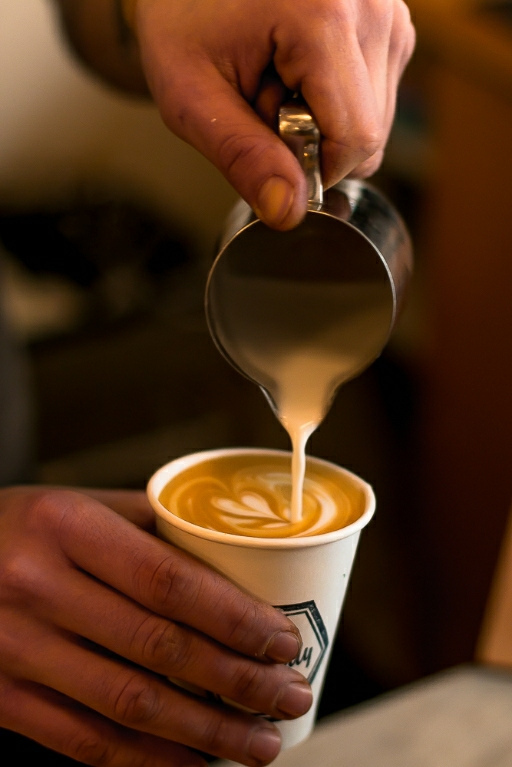 I’m a little shocked– is that man making a latte in a to-go cup? In Paris? I am always startled by the prevalence of Starbucks in Paris these days! 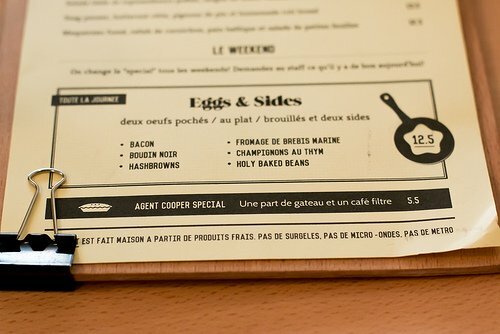 Last year I was “caught short” in the 15e so we went to a random café on the Rue St Charles and my husband ordered us a coffee while I made myself comfortable. I had forgotten just how simply delicious a plain “Express” can be – and that was a truly delicious cup of coffee! I hadn’t wanted one, but it was so good I’m glad I had it. Really, Starbucks and its competitors have simply nothing to say to coffee like that! Having said that, there is mediocre coffee to be found everywhere! I buy my ground coffee in France simply because its cheaper, and because I am 99% certain I shall like it – this is simply not true of coffee I can buy here in the UK, which is more expensive, too…. I love your blog, love your down to earth writing and philosophy and love coffee! A couple of years ago I visited friends from Beiruit; the husband of this couple loved espresso and, being retired, decided to make the best possible. Having unlimited funds and an inquisitive mind, this decision led to the purchase of the best possible grinder, roaster (yes, roaster) and beans from some exotic place. I was amused until I tasted the espresso that resulted from all this — it was pure bliss, I could have sat under the shade trees and spend the entire day drinking espresso and smiling. I can’t wait to get back! Here in Mexico, I have an old Barista from Starbucks, buy beans when in San Diego, grind them daily in an old spice grinder, steam my milk and call it a day. It’s fine, but . . .
For me it was Columbus Cafe that changed the coffee game in Paris. They were ahead of their time. Yes, Columbus Cafe predated Starbucks and other coffee places. I’ve not had a coffee there but they’ve been in Paris for a while, serving les muffins and such, as well as coffee-based drinks. Some of those photos remind me of right here at home on good old Seattle! Specially filtered water and raw milk? Oh my, yes! The food looks incredible as well. I’m bookmarking these places and definitely hitting them my next trip to Paris. Thanks for the info! 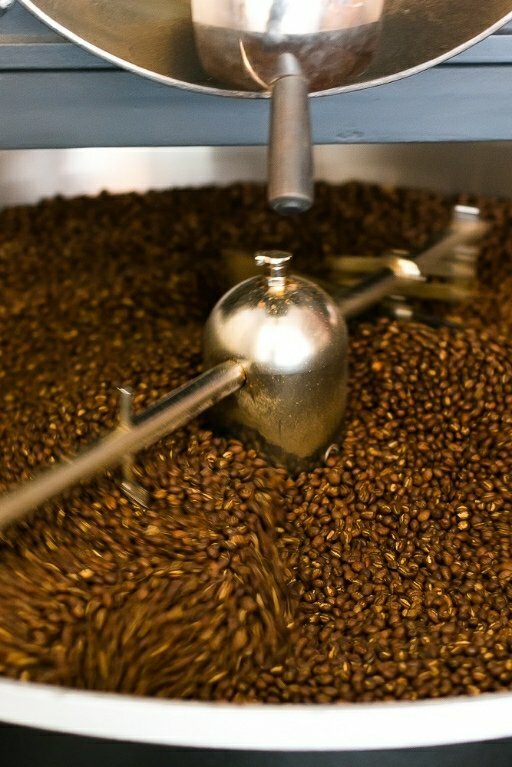 We’ve never roasted our own beans, but hubby and I have been enjoying fresh roasted beans for over 38 years. Oddly enough we became smitten while living in Little Rock, Arkansas. Walking along Kavanaugh Street we were hit by an aroma so heady and deep we were sidetracked from our trek to the ice cream shop. Wound up in the River City Coffee and Tea Shop. The experience changed our lives. Thanks for sharing the cuppa with us! Premium coffee out of a paper cup? 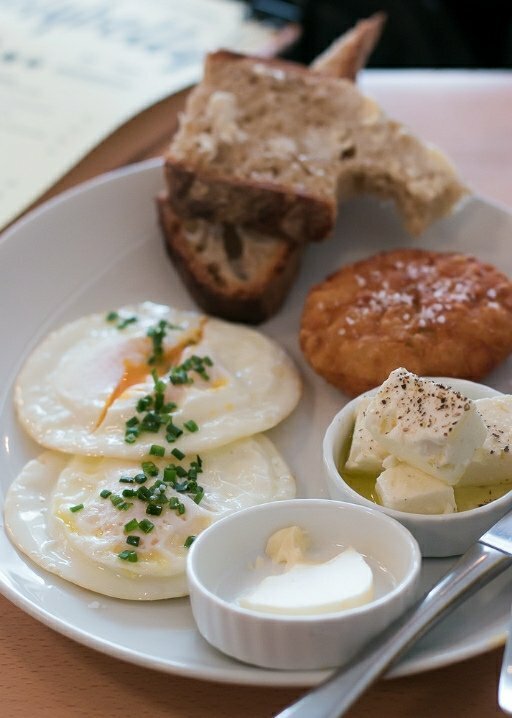 The breakfast looks great but how do they get those perfect poached (of fried?) eggs? Do they use a ring in the skillet to keep the egg from spreading? I didn’t see them making them in the kitchen, but they likely use egg rings. They produce pretty nice fried eggs, because the whites are thick so they don’t get rubbery. 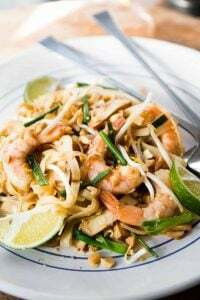 Plus they’re easier/nicer to plate up! 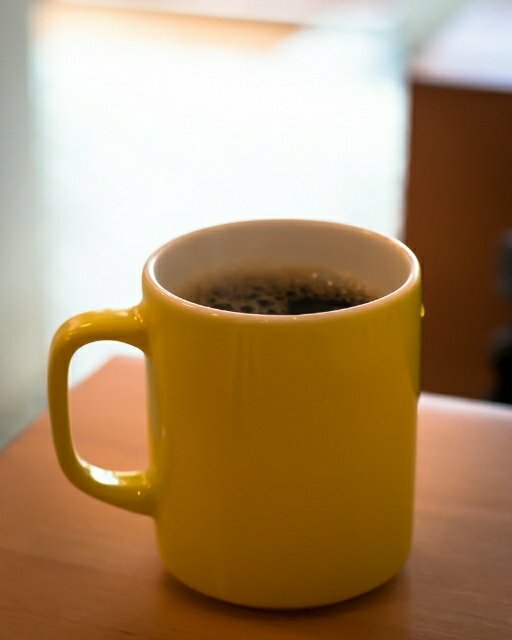 Great post on a favorite topic; I also second all the comments by CoffeeGrounded. My epiphany came on a San Francisco street in the early 70’s when I first experienced fresh roasted and ground beans and the various ways to make great coffee. Since then I have been labeled a coffee snob because if I’m going to enjoy coffee it has to be great cup made with fresh ground beans. I will admit laughing over some internet ‘coffee’ sites that take my mild coffee snobbery to a higher plane with their water temps, types of filters, grinders, roasters etc. Coffee is a treat and making it easily mastered especially for that first cup of the morning. I used to grind my own coffee in a Braun (burr) coffee mill, which I thought was fine. Then I got an espresso machine and when I was in Italy, they told me unless you had a grinder that was as good as a professional one, you were better off buying your coffee ground. 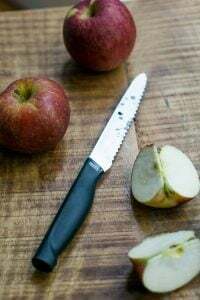 I loved how some of those top-quality grinders looked, but it was hard to justify when I was living in a very tiny apartment, to give up 20-35% of my counter space to a grinder (even as much as I love coffee.) When I was learning to make espresso, it was interesting all the steps that go into making it right. But then you go to a caffè in Italy, and those folks just turn out fairly excellent coffee without all the hoopla. 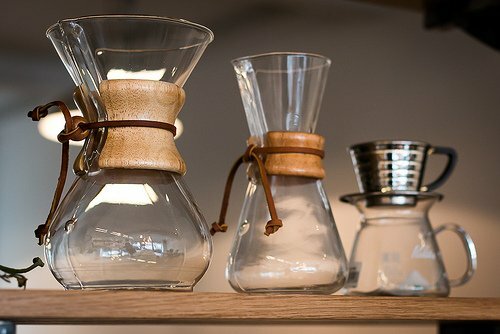 Did you know that old Chemex carafes are going for upwards of $150 on eBay now? Wish I’d kept mine. I remember those Chemex pots from The Mary Tyler Moore Show and, of course, I wanted one. 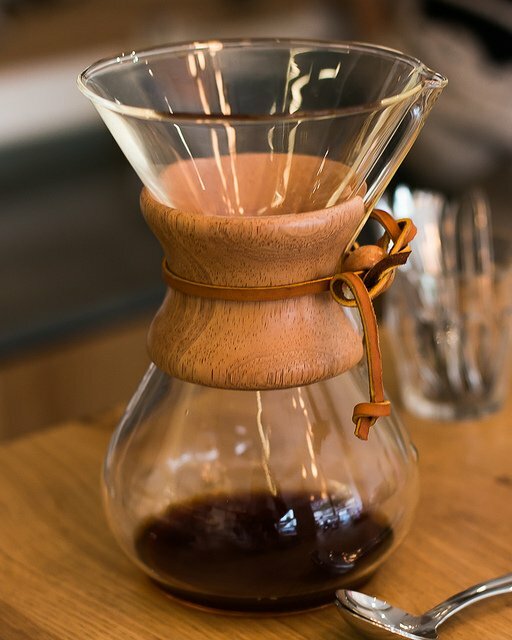 According to a friend who has a Chemex: “Peter Schlumbohm, who developed the Chemex, cautioned about pouring from what looks like a spout; the spout is for air, not for pouring.He was adamant about that.” I thought that was pretty interesting. 500g is a pound, not half a pound. Tsk tsk. Really love your posts, though. So thanks for all of them. Spending a week in Paris in early April (to see Into the Woods) in a friend’s flat in the Marais. Any Suggestions for a good restaurant in the 3rd? Thank you so much for this post! I am in paris now for three days, read this last night, and went to holybelly for breakfast this morning – it was every bit as friendly, warm, welcoming, and delicious as you described. A perfect start to a day of strolling and site seeing in the February sunshine. For others, we got there at 9:30 am for breakfast and had no trouble being seated right away but the cafe was really filling up when we left. I love how Nico is wearing a Rocky t-shirt — given that Rocky the musical is opening in NY, this is for me another sign of the Brooklynization of Paris ha ha ha. Can we have photos of Nico in every posting from now on? I’m not a lover of coffee, but I think I am a lover of Nico! Food looks amazing, and did not know that regular coffee has more caffeine than espresso! Makes sense because I love drinking espresso but if I have a cup of regular coffee it makes me feel sick and I cannot eat all day. Uh oh, that gorgeous barista’s lips have gone blue (second to last photo)…the tell tale sign of a toxic liver, according to Chinese medicine! Hope he does a spring liver cleanse, somehow. Illy is under appreciated in the US, in my opinion. 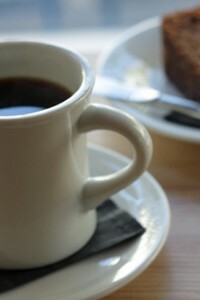 I usually hang around coffee shops in my spare time, and I really enjoy new different variations of flavor. I never knew this is how it’s being prepared. Brilliant! 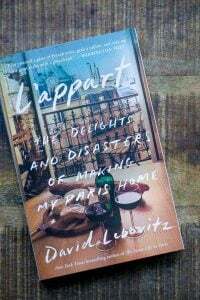 “I received your e-mail after my afternoon alone but was fascinated reading David Lebovitz’s blog. I had confused him originally with the David from David’s cookies. He’s right! I don’t think you are “my” David (as I already have one I’m married to) but I like the idea of claiming you as well because you are wonderful. David, will you be doing any book signings during the last week of March? I would love to go to one! The milk may well have been raw when they acquired it, but it certainly isn’t once it’s steamed. 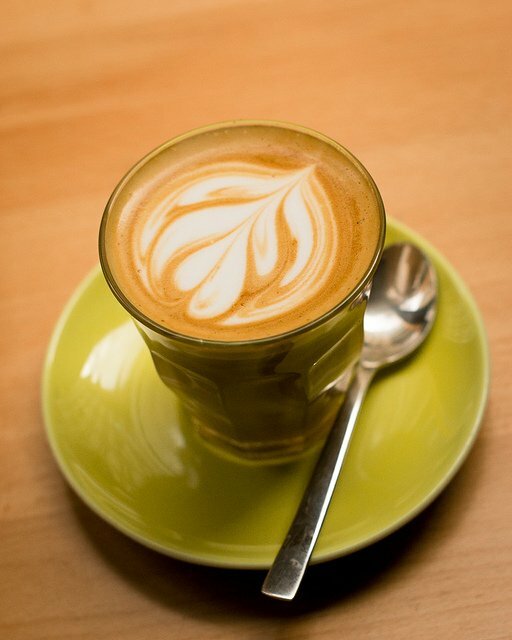 Interesting stuff about coffee. I had a “ahead-of-its-time”, coffee roaster and retail on the rue Cherche-Midi in 1992. Originally from San Francisco, I started roasting on Fillmore st in the ’70’s, originated the name ‘HAS BEANS’ in1979 in the Castro. Rave reviews of both San Francisco and Paris ensued and all was well. I also have, here in Paris, antique Chemex, blown glass from Germany and makers mark near the spout. I currently roast my own coffee at home in a perforated drum like commercial roasters. 454g is a pound, not 500g, which is 1/2 kg. David, I’m almost exclusively a tea drinker. Occasionally, I’ll have a latte when I’m out. At home, I only ever make coffee when we have our “coffee” friends over. They bring me the beans they’ve just roasted and ground themselves and I make either pour-over or French press, depending on the grind.